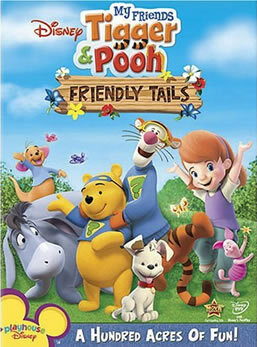 A new Pooh DVD has hit the shops and it's called My Friends Tigger and Pooh Friendly Tails. It continues on from the new TV series with the same name, featuring the new girl character called Darby. Of course, Tigger, Pooh, Piglet and all of your other favourite characters are also in the movie. Christopher Robin even makes an experience in a couple of the episodes! Darby, Winnie the Pooh and Tigger work together to solve mysteries in the 100 Acre Wood, following clues and interacting with the animals that live in the forest. In the first episode, Pooh and Tigger are taken ill with a cold and Darby, with her trusty companion Buster, go and find some special medicine. In the second episode, the team help give Darby a tail. In the final episode, the team set off on an adventure to find buried treasure! The film is produced using CGI, which stands for computer generated imagery. It's a technology that is now commonly used by film makers to add special effects to blockbuster films. Watching the characters of Winnie the Pooh come to live in CGI is a real treat for the whole family and it shows how far things have come along since the original movie The Many Adventures of Winnie the Pooh. The film is ideal for children of all ages, but it's mainly aimed at preschool children. The movie has well reviewed by many internet websites. Some people are upset that some characters like Owl don't make an appearance in the movie, or that some others only make a rare appearance. On the DVD, you'll also be able to find some exciting special features - including a very special game. The film is out on March 4th in all good movie stores. The movie lasts for 72 minutes and contains three separate episodes.